Sushi has increased in popularity in America so much that school cafeterias carry the stuff now. As well as most supermarkets. Unfortunately, most people think about the sliced rolls of rice and seaweed as the incarnation of sushi (in fact, cooking shows almost exclusively focus on this when they say they'll teach you how to make simple sushi at home). Japanese cooking, however, focuses on quality of ingredients, and minimalism in handling. American interpretation is usually just gimmicky. Sushi's soul, of course, is in the rice, and it comes in multiple shaped variants. Aside from the rather well known nigiri (topped rice balls) and maki (rolled) forms, perhaps the simplest and yet most enjoyable is the chirashi (scattered). For the version I got, nicely cooked sushi rice is topped with small nuggets of tuna and eel. 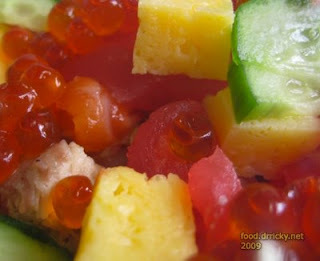 Emerald fragments of cucumber float among yellow cubes of egg, and jewel-like orbs of salmon roe. 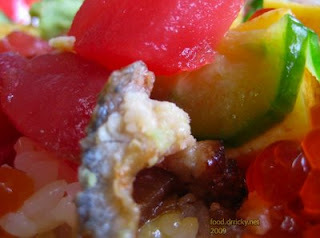 The textural and flavor contrasts are likewise delightful. 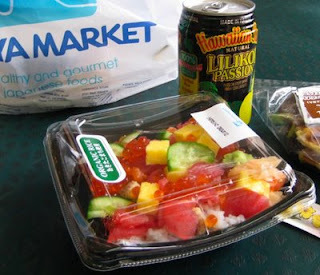 Lunch from Nijiya Market, Sawtelle, Los Angeles.